Former presidential candidate of the Allied Congress Party of Nigeria, ACPN, Dr Oby Ezekwesili, has denied allegation that she stepped down from her presidential quest following promise of a ministerial appointment by an unnamed presidential candidate. This came as she disclosed that she denied similar offers from successive administration after Chief Olusegun Obasanjo's,where she served as both Minister of Steel Development and Minister of Education, respectively. 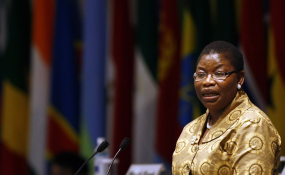 Ezekwesili,who described the allegation as "height of political comedy", at a press conference she held Monday,in Abuja,wondered why she would "go through the pains of launching a presidential campaign to negotiate for a role I last occupied twelve years ago and have thrice rejected since after?" She also denied allegation that she did not only raise but also looted her campaign donations, saying it was "only morally bankrupt politics that can make anyone even imagine such accusation against me." According to her, the allegation was a desperate attempt by the ACPN leadership to slander her. She said:"One of the more laughable moments of the past week was hearing allegations that my presidential candidacy was a scheme to negotiate for a ministerial role. "This is the height of political comedy, I must say. Here are the facts that speak for themselves. Since I resigned as a cabinet minister in 2007, it is known that I have declined offers by different governments to serve as a minister again. "Why would I then go through the pains of launching a presidential campaign to negotiate for a role I last occupied twelve years ago and have thrice rejected since after? "Such mud-raking tactics is the reason why our best minds abstain from offering themselves up for political office thus leaving the worst of us to lead the rest. It won't and can never stop me.
" It must not stop anyone of you who have watched the saga of the last week seeking to blemish me. It is in fact precisely why we must double down on disrupting this decadent "old order politics as usual in Nigeria. "More hilarious was the accusation that I raised and looted campaign donations. It is only morally bankrupt politics that can make anyone even imagine such accusation against me." Even as she said she was not above public scrutiny, the politician said:" No one is, but surely reasonable persons can see through the baselessness of these allegations." " My absolute dedication to public accountability is widely known and no matter how much we had hoped to raise as campaign support from the public we designed an accounting system to go beyond the basic minimum of accountability required by the Electoral Act. "For example, the accounting function and system was separate from my candidacy. It was independently managed for the campaign as you saw from the presentation just made by my Campaign Council. You could see the transparent details on what I contributed as a candidate, what we received as support from our fellow citizens and spent in the course of the campaign." "What is appalling is the dull, deliberate, diversionary attempt by the leadership of the Allied Congress Party of Nigeria (ACPN) to slander me. "As an official of government of Nigeria, I took a 90 per cent salary cut in order to serve this great country. I left government with my integrity intact and my name untainted.
" In all my years in the public, private, or development sector, there has never been any allegation of corruption against me. Not one.
" I have stayed true and consistent to my values - in private and public. If I remained incorruptible in government, would it not be senseless and cruel for me to suddenly be the kind of person that would divert funds and donations received from well-meaning Nigerians who believed enough in our vision for the country's future to contribute financially to my campaign? "She added. Dwelling more on the allegation,she said:"I am sure you've all heard some insinuations and allegations since my announcement of withdrawal from the presidential race. "My motives have been questioned with various versions of falsehoods being spread. I want you all fellow Nigerians to know that those allegations are alien to my character and pedigree. "The lies were cooked up by the perpetrators themselves in a deliberate hostile attack of my stance against bad politics and governance. "Let me reiterate that the #CitizensFirst campaign I ran was a serious one to which I was wholeheartedly committed. Millions of our citizens who followed our campaign on multiple platforms across the country can attest that we ran a promising campaign uniquely designed to be disruptive. We adopted a decentralized messaging strategy for maximum reach and impact. Our campaign was also appreciated by citizens for being empowering of the voters in contrast to the traditional campaigns that rob the largely poor electorate of their dignity. "I have never been one to go into a new venture without first measuring the odds, counting the cost or taking stock. "My candidacy was no different. Even though I was the latest to throw my hat in the ring, the campaign was not slack because we believed in the power of Nigerians to take their destiny in their own hands.
" It was a testament to our hard work in such a short time that whenever top candidates in the race were mentioned, my candidacy was always highlighted after those of the two-in-one dominant parties which make up the old political class in the country. We took our hopeful message to 15 (?) states and created a unique retail driven campaign that resonated with Nigerians." The former Minister of Education asked her supporters in particular and the public not to believe what she referred to as "vicious lies." "Some of our supporters gave us as little as N500 and etched themselves for eternal gratitude in my heart. Do not believe those vicious lies. Your support was part of why our campaign forced issues-based discussions in the presidential contest. Please be proud of what you helped us accomplish,"she said. "I also saw disappointment by some who had poured their hearts and hopes into actualising our mission to #Fight4Naija, bring back hope to our land and lift 80 million fellow citizens out of extreme poverty. "I ask for the forgiveness and understanding of all who are hurt by my withdrawal from the race even as I take comfort in the fact that they would agree with my choosing to stand with my values rather than compromise. "I am thankful to all who travelled on this journey with me, who attended our campaign events, who volunteered for the movement, who spread the word and sometimes argued with friends, and colleagues, who contributed and invested online and offline. "Thank you to the young people who accepted and owned our campaign, to the women - my sisters and comrades - who worked and walked with me, to every believer and supporter from different tribes, states, religions and walks of life. "You all are champions. Your sacrifices continue to humble and inspire me and I will never ever forget,"she said. Reacting to the position of the Independent National Electoral Commission,INEC that her withdrawal was of no effect giving the timing, Ezekwesili admitted that "based on the Electoral Act, the time has elapsed for withdrawal so the law still sees me as a presidential candidate." She, however, said having since suspended her campaign,she would work in the days ahead to ensure that the people who would have voted for her," cast their votes instead for the consensus candidate who will hopefully emerge from the coalition of willing credible alternatives in the coming days." "My lawyers have officially written to INEC in a symbolic gesture to make them aware of my separation from ACPN,"she said. She spoke of her plans ahead:"For me, I will get some needed rest, and go back to my professional work. But as a citizen, I have two big priorities going forward. "The first is FixPoliticsDotOrg, a values-based movement to disrupt our politics and reconstruct this country. In a way this is what I sought to achieve by joining politics in the first place. I realise that it would not be a quick fix, it is a marathon but the best time to set out is now. We must drive a citizens' movement built from the bottom-up and which possesses a clear identifiable philosophy. You will hear more about our agenda soon. "The second big priority for me is the establishment of a multi-partisan school of politics and governance; a leadership school that helps us grow a pipeline of leaders from the base. "Nigeria has not been deliberate in raising the next generation of leaders as some other countries like South Africa has. We must change that, otherwise we would continue to repeat this cycle where there are not enough people with the character, competence and capacity taking over leadership from the council level to the assemblies and state houses, up to the presidency. "2023 must not find us only trying to make change happen from the presidential level. We have business schools like the Lagos Business School, being deliberate about growing business leaders; there is no reason why we cannot have an equivalent for political leadership. It can be done and we will do it."